This coming Sunday, the Bahá’ís of North-East England will be voting for delegates to attend next year’s National Convention, where they will place votes for the membership of the National Spiritual Assembly. This is a short reflection on how Bahá’ís vote. There are four elected institutions in the Bahá’í Faith, throughout the world there are Local Spiritual Assemblies and National Spiritual Assemblies, at the international level there is the Universal House of Justice, and in many countries – including the countries of the United Kingdom – there are regional Bahá’í Councils. Bahá’ís do not have priests or a clergy, there are no individuals with the power to interpret authoritatively what the Bahá’í Faith teaches. Institutions are granted certain responsibilities by unanimous vote, but the members of those institutions hold no special status within the Faith. Bahá’ís are encouraged to read for themselves and to consult. In the event that a disagreement exists which cannot be resolved in this manner they can seek clarification from the Universal House of Justice, but the Universal House of Justice cannot change any law that has been revealed by Bahá’u’lláh, they can only make – and repeal – laws that are not already clarified by Bahá’u’lláh, ‘Abdu’l-Bahá or Shoghi Effendi. And so it is that every Bahá’í in the world has the sacred duty to participate in the electoral process for the Spiritual Assemblies that administer to the needs of the Bahá’í Faith in their locality, and for the Universal House of Justice. The election of the Regional Bahá’í Council’s does not include – even indirectly – every Bahá’í within their area of responsibility, but each Regional Council operates under the direction of their National Spiritual Assembly. A group photograph of the 11th International Baha’i Convention (for the election of the Universal House of Justice). The bouquet of red roses in the foreground noted the absence of delegates from Iran. © Bahá’í International Community. While the elections of England are held up as an example for their all-inclusive nature, there are some key differences between Bahá’í elections – and Bahá’í institutions – and the natures of elections and institutions that are more familiar in the West. 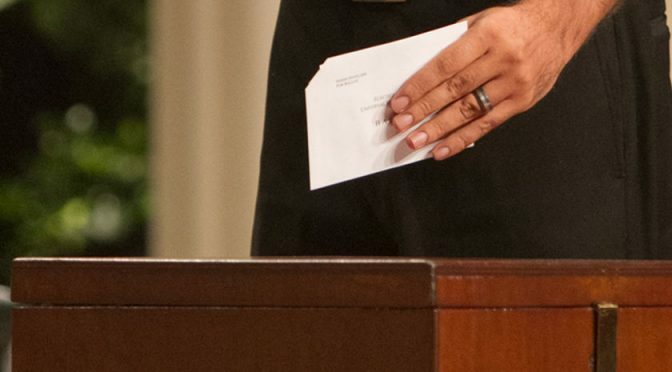 These unique features are similar for all of the Bahá’í elections and institutions, and I will come to them in a moment, but first I will give a brief outline of when and how the elections take place. In every city, town or village where there are nine or more Bahá’ís at the time of the First Day of Ridván (around April 21st), an election is held at which it is the sacred duty of every one of those Bahá’ís to vote for exactly nine individuals to serve on the Local Spiritual Assembly. Once a year, the members of each Local Spiritual Assembly vote for the members of their Regional Bahá’í Council (if they have one). The first stage in the election of the National Spiritual Assembly is an annual local meeting called a Unit Convention, at which Bahá’ís of the area gather to consult and to elect delegates for a National Convention. In the UK a total of 95 delegates will be elected for National Convention, until recently the UK had 95 Unit Conventions, each unit being a geographical area in which approximately 1/95 of the UK Bahá’ís were resident. 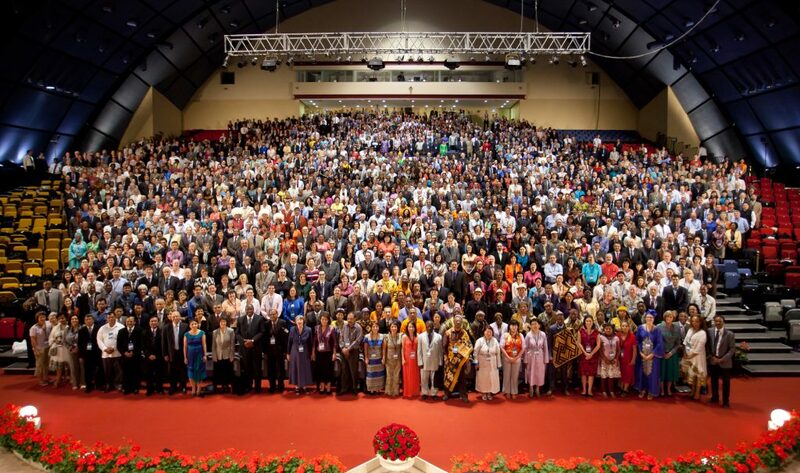 A few years ago the unit boundaries were changed to match the regional Clusters across which Bahá’ís were already working together, and each of these (generally larger) units is assigned a number of delegates to elect at their convention, representative of how many 95ths of the Bahá’í community are resident there. In North-East England we will be electing two delegates this Sunday, so every member of the Unit has a duty to vote for those two delegates. This can either be done in person, at the Convention, or by post. The National Convention usually takes place during the twelve days of Ridván (around April 21st to May 2nd) but is later if there is an International Convention that year. 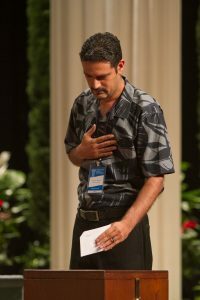 At National Convention, the 95 delegates – elected at the Unit Conventions – all cast nine votes for the nine members of the National Spiritual Assembly, and consult on the affairs of the national Bahá’í community. As with the Unit Conventions, delegates who are unable to attend National Convention may send their votes by post. 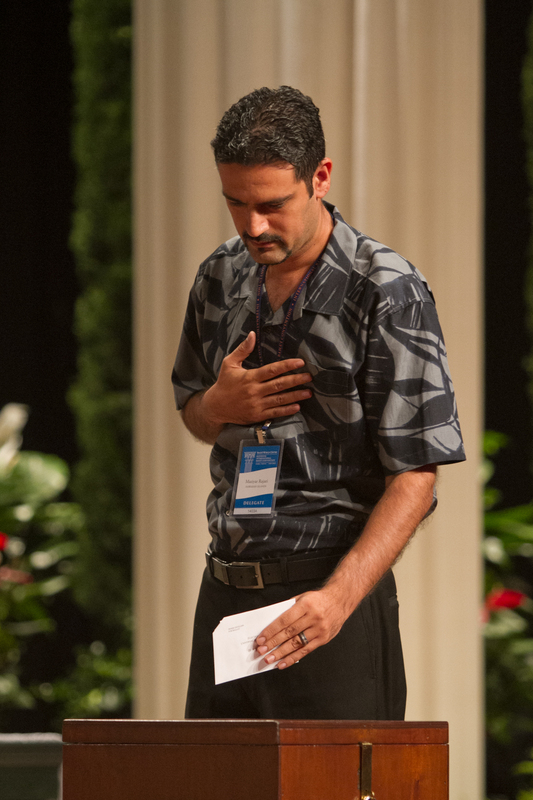 A delegate from the Hawaiian Islands casts their vote at International Convention. © Bahá’í International Community. Every five years, at the Bahá’í World Centre in Israel, an International Convention is held at which all nine members of each National Spiritual Assembly are asked to vote for the nine members of the Universal House of Justice, the international governing body of the Bahá’í Faith. At the last International Convention, in 2013, delegates from 157 countries cast their votes. The next International Convention is in 2018, therefore the individuals who were elected to National Spiritual Assemblies this year will be invited to attend International Convention from April 29th to May 2nd. So it is that, for Bahá’ís, the process of electing our institutions is a spiritual and sacred duty, and being elected to serve is not an endorsement of our personalities but, rather, the result of a prayerful process which breeds unity within the community.